Whether you are looking for lots to fill your days or would rather do nothing at all, Hamilton Island holidays offer the perfect mix of both. Unlike many of the other Whitsunday Islands that only offer a limited range of accommodation, there is an impressive range of Hamilton Island accommodation to choose from meaning that no matter what your budget and interests are or whether you're after a romantic getaway or relaxing holiday for the whole family, there is a great selection to choose from when it comes to where to stay on Hamilton Island. Better yet, all Hamilton Island accommodation is conveniently located just a short stroll from a variety of shops and restaurants, activities, pools and the beautiful beach. The exclusive adult's only beachfront resort known as Beach Club offers a private and intimate holiday experience. Featuring boutique accommodation and luxurious modern rooms, the resort offers some of the finest service in all of the Whitsundays. If you'd prefer a little more independence, the Hamilton Island Holiday Homes located on the northwest side of the island offers self-catering villa accommodation available in Standard, Superior and Deluxe categories ranging from 1 to 4 bedrooms. 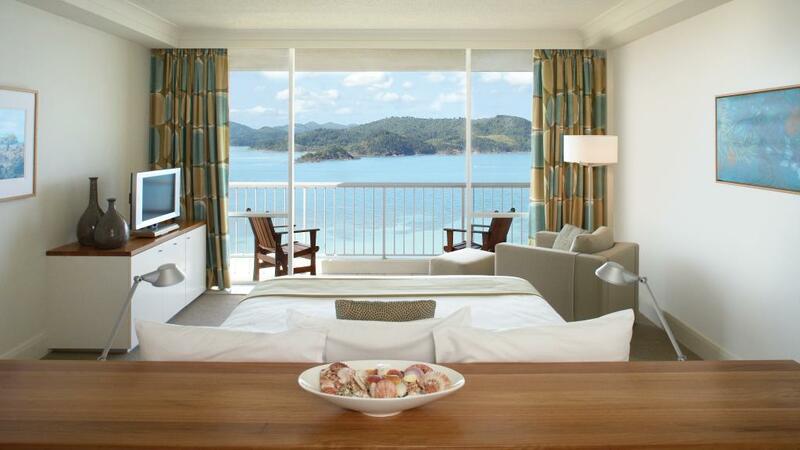 For those who love waking up to beautiful views, the Hamilton Island Yacht Club Villas are ideal. Offering luxury accommodation with self-catering facilities overlooking Dent Passage and the surrounding islands, the resort is close to the marina, and Hamilton Island Golf Club and is perfect for families and small groups. If you're looking for something more affordable, the individual Palm Bungalows surrounded by lush tropical gardens are ideal. Offering spacious accommodation complete with their own private balconies, the resort is close to the swimming pool, restaurants and beautiful Catseye Beach. Catering to both the luxury and affordable crowds, the centrally located Reef View Hotel offers spacious accommodation overlooking spectacular views of Whitsunday Passage and the Coral Sea and is home to a great range of onsite facilities including unique external glass lifts. Offering all the convenience of a hotel with all the spaciousness and facilities of home, Whitsunday Apartments are perfect for those who want a little independence while on holidays but still want to be looked after. Featuring movies on demand and regular housekeeping, the apartments also enjoy the flexibility of a full sized kitchen and are ideal for both couples and families or groups of friends.